WHITE CHEFS HAT & APRON SET : PREMIUM POLYCOTTON FOR COMFORTABLE, BREATHABLE WEAR! Does your little one dream of working in a busy kitchen and want a breathable, comfortable, Apron & Chef's Hat? Rather than loose, elastic play chef caps, would you like a super secure, fully adjustable professional chef's hat, perfect for your little Chef? If so, Obvious Chef Child's Chef Hat & Apron Set is the perfect choice! Designed with a large, tufted mushroom style our set is ideal. For use in all kitchen environments, our Chefs Hat & Apron Set is manufactured from breathable poly-cotton material which prevents the build-up of excess heat, together with an adjustable Velcro headband, to easily adjust the hat for the perfect fit that resists slipping and sliding when you're busy in the kitchen, for comfortable, non-irritating wear that's fun and energetic! - Large mushroom design, fits comfortably for all hairstyles. - Velcro adjustable size won't slip and slide when leaning or bending. - Machine washable for fresh, clean everyday wear. - Plain white color, perfect for matching modern chef's uniforms. 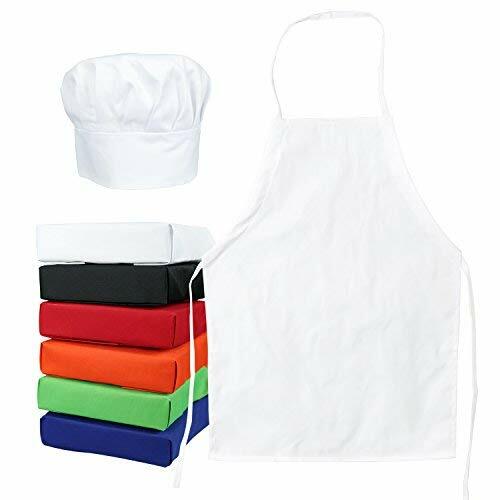 If you're looking for the perfect set either for play, or for a professional touch at home, our Child's White Chef Hat & Apron Set combines machine washable, breathable material, a non-slip adjustable Velcro fit and a professional, white design, for the greatest value Chef's Hat & Apron Set on the market! Click "Add to Cart" now! ✦ DURABLE: Professional quality, fully machine washable. ✦ BREATHABLE: The Polycotton material - allows heat and moisture to escape. If you have any questions about this product by Odelia, contact us by completing and submitting the form below. If you are looking for a specif part number, please include it with your message.